I note that Paul Nuttall, Lisa Duffy and Nigel Farage are now trying to claim that Mr Gregg Beaman ( pictured above) stood down as lead MEP candidate in the North West for health reasons. They are LYING. Nigel Farage was beside himself with fury when Gregg Beaman was elected the North West’s lead MEP candidate. He told his various sycophants that ‘he did accept the result’. Paul Nuttall, his nasty little sidekick, was told to start drawing up a list of complaints to be used against Mr Beaman. Suggestions ranged from ‘using his position as RO to gain advantage over his rivals’ to ‘posting on the internet in order to bring the party into disrepute’. Nuttall readily agreed and eagerly set to work on fabricating various complaints. 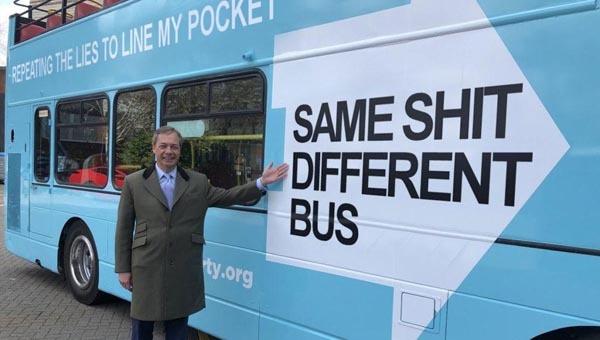 Nigel then told Gregg that he could not remain as an MEP candidate AND the RO for the region. He would have to choose either one or the other. Nigel hoped that Gregg would put his job before the Euros and stand down. This would save Nuttall making his complaints to the NEC and thus prevent any potential hostility from NW members who would, quite rightly, feel aggrieved that Nuttall had engineered the downfall of their chosen man. Surprisingly, John Whittaker finally showed some backbone - pity it’s made of jelly - and promised to support Gregg if he wanted to stand and fight his corner. By this time Mr Beaman was sick and tired of the whole sorry saga. He resigned from both positions and walked away with his reputation and dignity intact. Nuttall, on the other hand, has shown himself to be as treacherous and dishonest as his mentor.